One of my very favorite benefits of essential oils is the support they have been for my emotional wellness. If you’ve read my blog for long you know that I need all the help I can get. ha! For the first time in many, many years my moods are no longer the roller coaster they used to be on a nearly daily basis. Praise God! The combination of eating well, exercising, changing my mindset, and using essential oils and supplements has been LIFE CHANGING for me. I shared earlier this week about the very specific things I did that allowed me to successfully get off my anti-depressants and also lose 42 pounds over the last year. 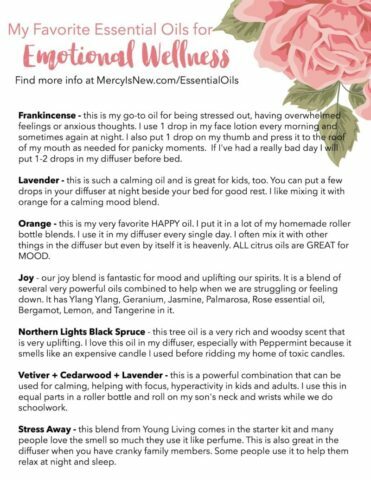 Today I want to share this list of my favorite essential oils for emotional wellness! Why do essential oils work so well to support healthy emotions? Think about a memory that you have that is associated with a smell. Does baking chocolate chip cookies remind you of your grandmother? Does a certain kind of lotion make you think of your aunt? This is your limbic system at work!! So, instead of smelling and breathing in toxins all day long (candles, air fresheners, room sprays) choose HEALTHY things like essential oils — from God’s pharmacy — to not only make your house smell good but also HELP SUPPORT YOUR EMOTIONS at the same time! This list shows you my favorite oils and HOW I use them! **Note: the colored labels are for diffusing and the vitality/white labels are labelled for ingesting. If you’re brand new to oils or looking for a team to join, you can read more about my journey with essential oils and sign up as a wholesale member on my team: Love, Mercy, and Oils.